Hope everyone has had a good week. Here in the UK we have had our twice yearly, ‘oh my God it has snowed, panic, panic do not travel’, buses stopped and everyone suddenly appears dressed for the slopes at Klosters. Other countries with real snow all winter must really laugh to see the reaction here and there have been lots of pictures on Facebook of people managing perfectly well on roads with 20 feet of snow either side.However they do have it more than we do and have the right equipment. 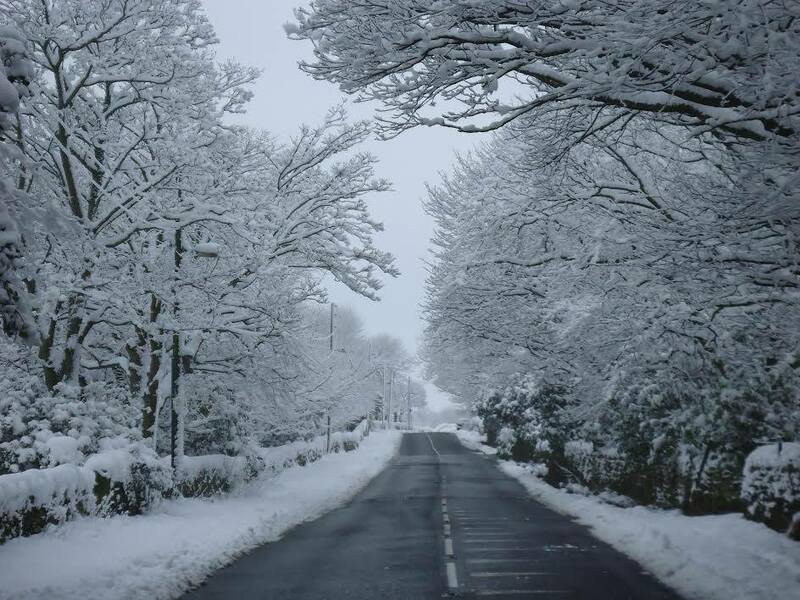 It has been very pretty though and this photo from the local news shows you the loveliness of it all. It has nearly all melted now leaving my garden looking worse for wear so will have to get out and give it a good tidy up. I wanted to show you some of my pictures from our recent trip to the city of Murcia in Spain. Mum, my Aunt Maureen and I went on a coach trip there, it is about 40 km inland from where Mum lives and the drive alone was very lovely. We often go on these coach trips as it is a great way to see the country, they are good value at about 10 to 15 euros each and it is a lovely day out with no hassle driving or parking. 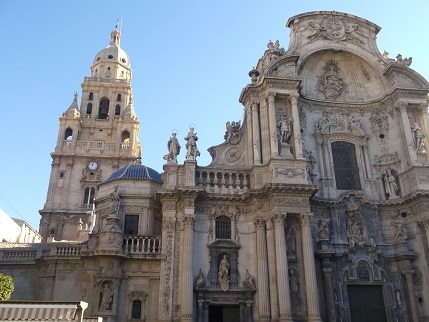 I have been to Murcia twice before but never managed to get inside the cathedral. 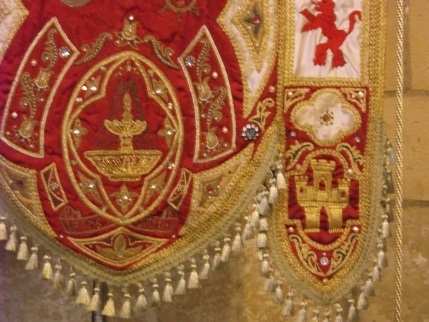 This time we did make it and to the cathedral museum, also the museum that houses the large statues that are paraded at Easter and to the Casino, which is the gentlemen’s club built in the late 1800s. I have put together a slideshow of some of the best bits here. 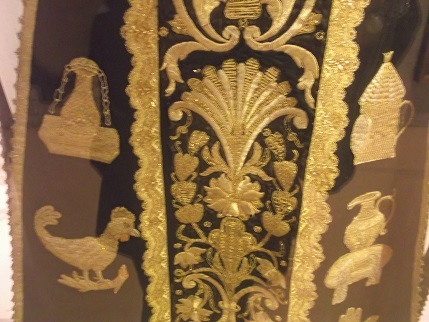 As always there was beautiful goldwork, some dating from the 1700s, in the cathedral and museum. As well as tapas in a very lovely bar that dated from the 1920s full of old pictures and posters of bullfights and a couple of stops for coffee and a little retail therapy (two very cute Moroccan style tea light holders – I know I don’t need any more candle holders but they are lovely!) we amused ourselves very nicely. 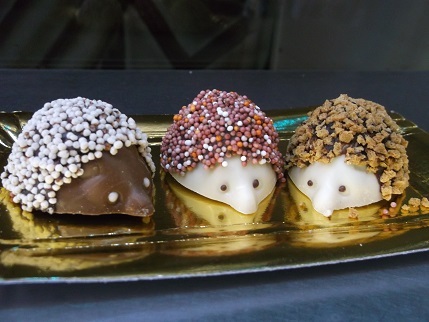 We also found these very cute little chocolate hedgehogs and had one each! I am planning to hand stitch for the rest of the day, still working on the hexi cars, have changed my mind about the design so yesterday took apart all the stitching I have done this week so am starting again! Beautiful pictures! There are times when I wish Europe wasn’t an ocean away. This is one of those times. I feel the same about America (and the rest of the world!) so much stuff out there that I want to see! 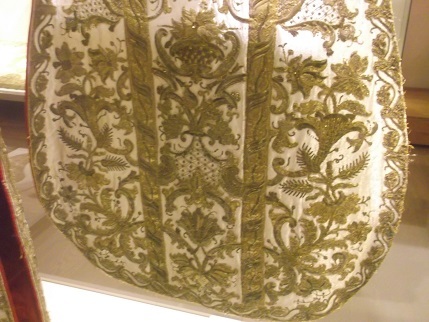 It can be very hard to get a proper chance to study embroidery in museums – I hope your planned visit is successful.